To be truthful, I have only made a few things from these books. 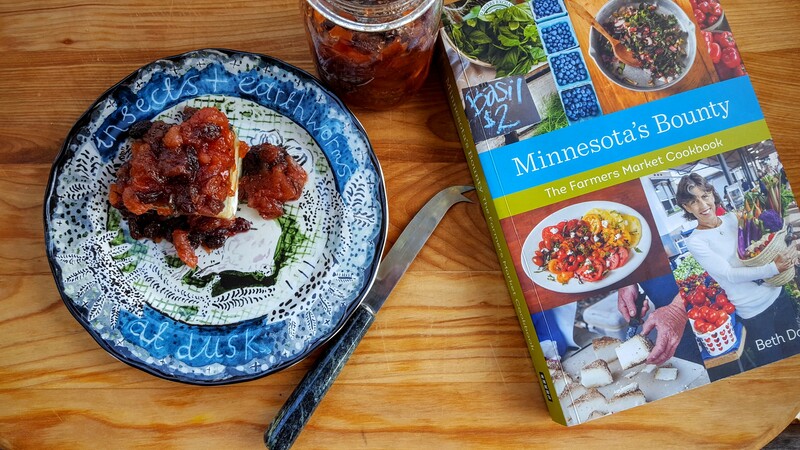 Last summer I made Balsamic-Basil Strawberry Jam from the Minnesota book. It is a keeper. Last weekend we traveled to Livesay Orchards to buy some apples. We came home with about a peck. I really needed to use them up so I went back to Minnesota’s Bounty to peruse the apple section. 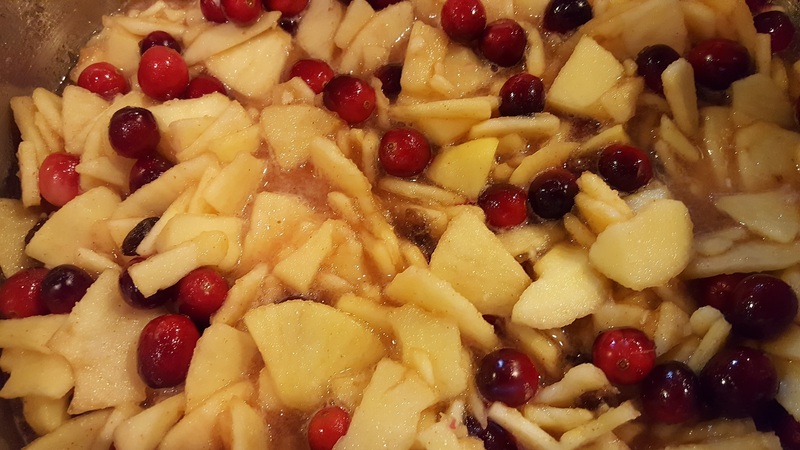 I had never made chutney, but I found a great recipe for an apple cranberry one in Minnesota’s Bounty and I knew my BiL would love this as a Christmas present. Dooley’s recipe made 10 pints, so I halved it. Otherwise, the recipe is true to what is in the book. Prepare a canner and sterilize jars and lids. Combine the onions, shallot, ginger and a bit of the vinegar in a blender and puree. Transfer to a large stainless-steel pot and add the remaining vinegar, cinnamon stick, apples, cranberries, honey, mustard, cayenne and salt. Bring to a boil, reduce the heat and simmer until thickened, about 45 minutes. 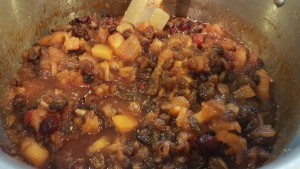 Add the dried raisins and cook another 10 minutes. Remove cinnamon stick. Ladle the hot liquid into the prepared jars. Leave 1/2-inch headspace. Wipe the rims, center the lids, and screw on the bands. Process the jars for 10 minutes in enough boiling water to cover the jars by 1-inch. Turn off the heat, remove the canner lid and allow the jars to remain in the cooling canner for 5 minutes. Remove jars. Cool for at least 12 hours before storing in a cool dark place. This recipe makes about 5 pints. 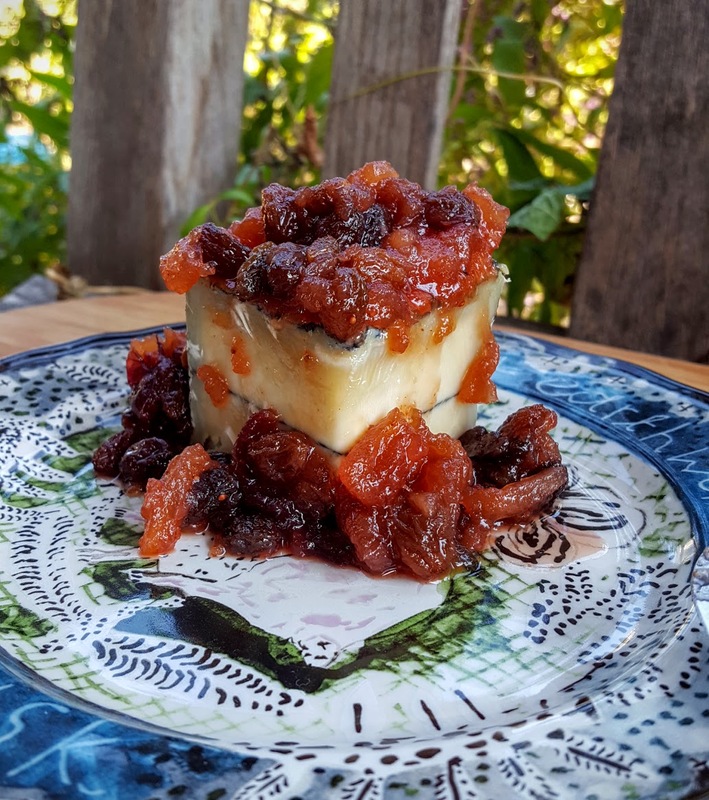 Dooley writes that this “spicy winter chutney is wonderful with ham and pork or on top of a soft cheese.” To try out this recipe’s worth, I spooned some warm chutney on top of a Humboldt Fog. Delicious! Besides this savory apple recipe, there is also a great sounding apple bundt cake with oatmeal and yogurt. You may see it here soon, too. This book hits most every fruit that one could ever dream of (and possibly find at their farmers market) from the aforementioned apples to pears and quince and strawberries. The vegetable section is even more comprehensive and includes recipes for your average veggies plus bitter melon, bok choy, fiddleheads, leeks, ramps, parsnips and sunchokes. There are also sections on cheeses, grains, and meat and fish. 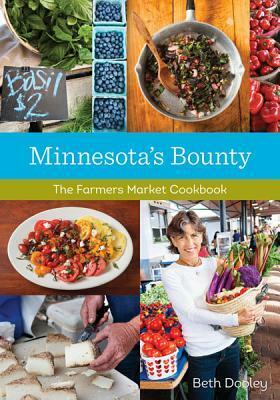 The final section is entitled “Market Essentials” and includes instructions for basic mayo, vinaigrettes, stock and a “spirited whipped cream.” Obviously, Dooley also sings the praises of various Minnesota farmers markets as well as the benefits of shopping at them. You don’t have to be from Minnesota to enjoy and learn from this book. I like chutney quite a bit but I’ve never prepared it. Yours is pretty enough to go in that cookbook, seriously good looking and inviting. You have a very thoughtful sister, what a neat gift to get. My sister is the best! What a great delicious sounding chutney! I can imagine all the good recipes in that cookbook and I will be checking it out. Thanks, Pam. Hope you do. I was looking for fresh cranberries the other day. Haven’t seen any yet, but they’ll soon be here, I’m sure. Will have to make this when I find some — what a nice, tasty seasonal dish. Thanks! I used frozen in this concoction. It is almost fresh cranberry time though. What do I want more? That chutney or that cheese! I don’t think I have ever made chutney but this looks like a great first try, I would 1/4 the recipe for me lol. It would be easy (and worth) halving again, Evelyne. The photo of Humboldt Fog with your chutney is the best-looking food pic I’ve seen in ages. I just love chutney — my cranberry recipe doesn’t have apples like yours, though. Right now I need a recipe for onion chutney, which I had on several pub-style sandwiches in London and Ireland. You are too kind, Mae. I can’t wait to try this with some grilled pork. I hope you find that onion chutney recipe and then post it! I love chutneys especially with cheese! This looks absolutely perfect Debra! 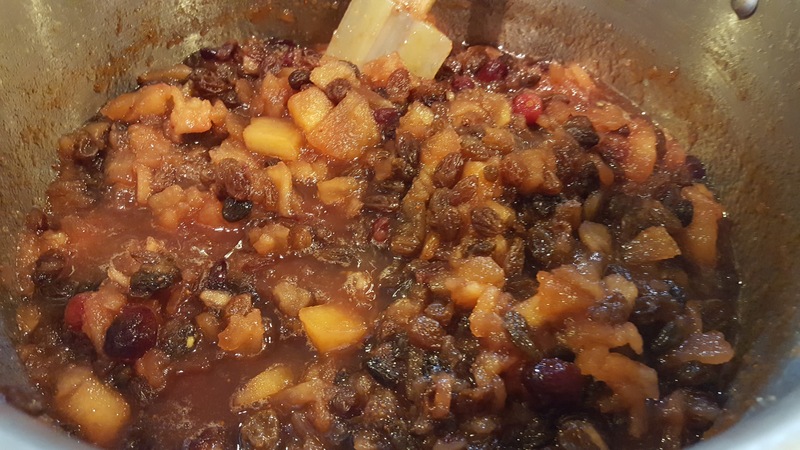 Fabulous Chutney! Love the combination of fruit and perfect to pair it with cheese!